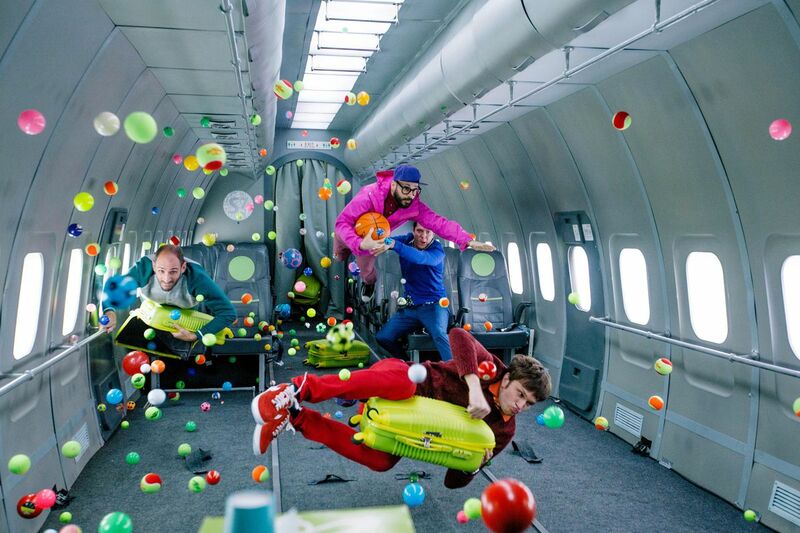 Alaska music fans may recognize the music of OK Go. But they have almost certainly been captivated by the band’s wild, inventive videos, which collectively have hundreds of millions of views on YouTube. With their new “Live Video Tour,” the band is attempting to take the highlights of those videos and move them to the stage. It was a concept that the band initially rejected, according to guitarist-singer Damian Kulash. But with the current tour, set to hit Fairbanks and Anchorage this weekend, the band believes it’s found an approach that’s as imaginative as its viral videos. It started when the band’s bassist Tim Nordwind watched an old silent Dracula film that was being shown with an orchestra performing a live score. The band took the idea and added some special twists and multimedia surprises. OK Go’s history of producing eye-popping videos goes back to 2006, when the video for “Here It Goes Again” became an internet sensation. The video featured band members performing a choreographed routine on treadmills. The videos have evolved into much more than eye candy. Kincaid Elementary kindergarten teacher Mandy McConnell has used an OK Go video to spark interest in a physics segment for her class. Part of the assignment was for students to create a Rube Goldberg machine, with an elaborate layout that creates a domino effect. OK Go’s video for “This Too Shall Pass” gave the students a large-scale example that inspired them to create their own machines, complete with a musical soundtrack. The experimental element is key to both the band’s musical and video creations, according to Kulash. While the band is best known for its videos, Kulash said they mainly focus on writing good songs and letting their imaginations take over once the songs are complete. Kulash said the performance is part of the band’s ongoing attempt to explore the full extent music’s possibilities and potential impact.